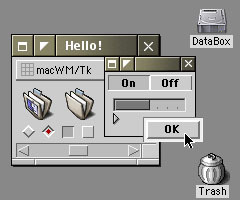 “Kaleidoscope” is an interface customization utility for the Apple Macintosh (Classic Mac OS, System 8/9). The official webiste, kaleidoscope.net, is now off-line, but you may still access the last valid snaphot (as of 2014-12-29) at archive.org and dowload from there the last version, Kaleidoscope 2.3.1. All schemes displayed here may be downloaded for free. All schemes are for Kaleidoscope 2.x and centered around OS-emulation and usability. Downloads (stuffit-archives) represent always the latest version. All schemes © N. Landsteiner / mass:werk. 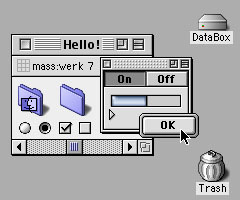 Apple's System 7 with a touch of platinum. 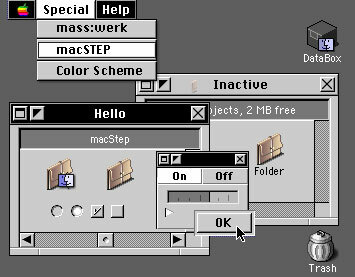 Mac's best interface even improved. Enjoy the friendly openess of System 7 (in a slightly modernized fashion). A brushed up Mac appearance. Yet another brushed color scheme. 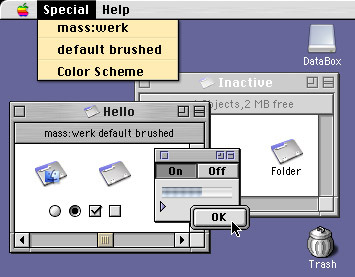 "mass:werk default" with brushed metal windows. 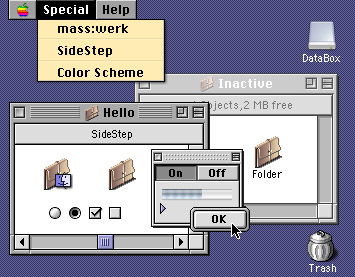 A step aside combining elements from classic Mac, OPENSTEP, and Raphsody. Be-like, tabbed windows, elements from classic Mac, Raphsody, and CDE. Optimized for productivity and low eye-stress, hence "ergo" for ergonomy. 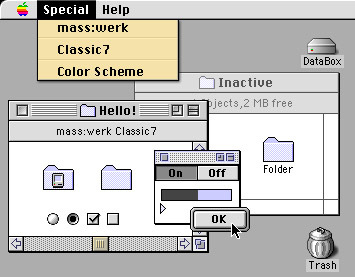 The look of the Apple Lisa Office System brought to your Macintosh. 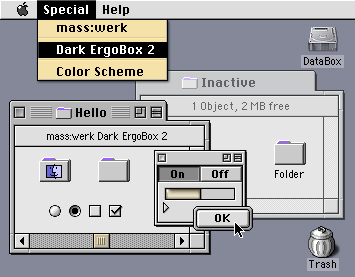 A reconstruction of the first GUI commercially available. For historical interest only. Apple Lisa system fonts, for use with "Apple Lisa revisited"